Creeping on people is awesome. Errrrr....we mean when you have something precious to look after, it's not a bad idea to install a surveillance system. But who has the money or the time to review hours and hours of footage. That's what's so beautiful about the Butterfleye. 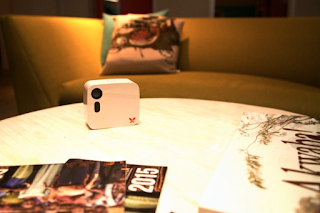 This home camera can actually detect when a human and/or animal is in the house, at which point the camera will record. At all other points, the camera turns off, eliminating the issue of having to spend copious amounts of time surfing through footage. Even cooler - when there's an unexpected person/animal in your house, you'll receive a push notification! Not sure about you, but we can think of about a million amazing ways to use this small wireless device. As for that co-worker that keeps stealing your lunch? GOTCHA!